Lewis Black studied drama at Yale, and he's written 40+ plays, but comedy pays the bills. He's famous for facial contortions and acerbic commentary on The Daily Show. He's also an actor (see Hannah and Her Sisters, Jacob's Ladder, and Mad About You), and yearns for a situation comedy of his own. He's made several pilots for possible sit-coms since the mid-1990s, none of which have been picked up. Black narrated Quayle Season, a 1992 documentary collecting moronic clips from former Vice President Dan Quayle. Black on America: "It's by the people and for the people, you idiot, not by the corporation and for the corporation and let's have another merger next Thursday." 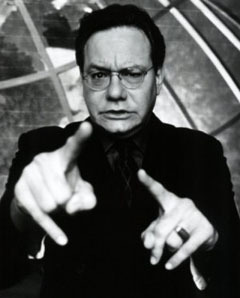 Lewis Black, Nothing's Sacred (2005), page 201: "Since my head was in a continual spin cycle at the drama school, it made perfect sense that I would get married at this time. The wedding took place at the courthouse in Rockville, Maryland, with just my immediate family and hers. Directly following the ceremony my brother and I walked out the door just as two officers of the law were passing by with a prisoner shackled between them. I looked at my brother and said, When God sends you a message He certainly makes it loud and clear. The marriage was finished in less than a year."